Product #60556 | SKU FW279 | 0.0 (no ratings yet) Thanks for your rating! 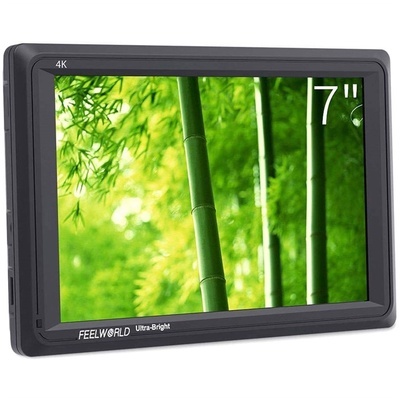 The Feelworld FW279 7" 2200nit On-Camera Field Monitor has extensive monitoring tools, including histogram, focus assist, embedded audio, false colours, zebra exposure, ratio marker, anamorphic mode, zoom etc. It could help you create wonderful shots. This model provides 7" an 8-bit IPS screen with 1920x1200 resolution, 323ppi pixel density, professional colour calibration to overcome natural LCD colour drift. The FW279 displays sharper images, better text clarity and colour reproductions regardless of your shooting conditions. The FW279 has a wide viewing angle so that everyone on set can review the action. The ultra-high brightness monitor uses the "golden size" 7-inch panel. The FW279 monitor not only has the resolution and pixel density to make every shot look amazing, the high bright 2200nit screen at almost 5 times the brightness of conventional field monitors lets you shoot outdoors without reflections washing out your image. This makes it a great choice for gimbals, Steadicam and director's monitors, delivering a crisp image without the bulk and viewing angle restrictions of a sun hood. Supports ITU standards and HD video Rec.709 standard consistent colour space, advanced image processing technology, so that the image clearly presented, the colour is extremely natural, to ensure accurate colour reproduction, to reproduce the physical nature of shooting, enabling users to accurately evaluate the quality of various input video signals. Histogram is a quantitative tool to cheque the picture brightness. The audio level metres provide numerical indicators and headroom levels. The peaking filter displays a coloured highlight on the screen where sharp edges appear.